Portovenere is very close to Cinque Terre but it is in general less visited compared to Cinque Terre. However, when we visited Portovenere for the first time we were so surprised by its beautiful landscape with its colorful buildings, picturesque harbour, labyrinth streets and many interesting sites. It is such a quiet town even in the summer holiday season. I have to say I like it more than Cinque Terre after our family spent a day there. The other good thing is that most of its attractions are within walking distance. You can easily plan a visit for just a couple of hours. If you finish reading my post you would probably have an idea to stay there for a couple of days. So what are the things to do there? Do you want to monetize your website? Sign up for a free membership and take a look first. Stroll along the Via Olivo to enjoy the views of the characteristic buildings and Palmaria Island across Le Bocche channel is a must. The characteristic buildings are attached to each other and form a tall corlourful wall. Some buildings are as high as 6 stories. Though they look like pretty seaside houses, these iconic buildings were originally built as a defense mechanism – a fortress protecting the inner town and castle. At the end of the promenade is the Church of San Pietro perched atop rocks. This Gothic and Romanesque style Catholic Church was built in 1256. The building is very simple but quite pretty. It hosts a statue of Saint Peter inside and has a fine decorated door. Below the church is a nice restaurant with several tables only. With panoramic views across the ocean, down the coast and across the harbour it’s definitely worth a pleasant visit. From San Pietro Church walk back towards the Doria Castle you will pass a rustic door on the left side. You can walk through the door and easily reach an observation deck of Byron’s Grotto of the Bay of Poet’s. The English poet Byron loved this bay. It was his favorite meditation and relaxation spot. Lord Byron often stayed here and used to swim across the bay to visit his fellow poet Shelley. The distance Lord Byron had to swim across the bay is quite far. When we were there it was a sunny and clear day. The sea was aqua blue and shimmery. Lots of locals were sun bathing at grotto and a group of people were learning scuba diving. But when it is a windy day and the waves crash against the rocks, it is not suggested to swim there. After the Byron’s Grotto you will spot a narrow steep stairway that leads you up the hill to the Doria Castle. On top of the hill you will have panoramic views of the Bay of Poets and church San Pietro. On a sunny day it is also a nice picnic place. The castle stands on a rocky plateau featuring steep walls and mighty archways in local stone. This majestic fortress was built around thirteen centuries and played an important strategic role during the Genoa Republic. There is another spectacular location next to the Doria Castle, the Church of San Lorenzo. It is also known as Sanctuary of the Madonna Bianca in honor of the local patron saint, of which it holds a legendary painting. The building was erected between 1118 and 1130. The stairs in front of San Lorenzo lead you down the hill and to a labyrinth of picturesque alleys. The upper area of this part is a residential area. Between the narrow alleys there are tiny courtyards for the locals to relax. It is well worth getting lost in those picturesque alleys and stairways. The narrow alleys finally lead to the ancient carugio which is called Via Giovanni Capellin. Most of the typical shops of the village are located here. Here you can visit many craft shops selling craft works and food shops selling for example, self made pesto. I can always find something new to look at with every trip I take in such town. Some venues offer high-quality made-in-Italy products. It has also attracted many VIPs to pass by. The shopping street is a pedestrian zone, winding, cobblestone alley, typical of the Ligurian towns. At the end of the shopping street is the town gate. It is time to sit down at a seafront café or restaurant and relax. There are a handful of restaurants offering Pizzas, sea food and meat dishes. The pictures from their menus are all attractive. We had a meal at a seafront eatery and tried some of delicious pizzas. One pizza uses pesto sauce, a typical sauce used in local recipes. We watched the fishing boats bobbing on the nearby water and the world walking by. It is such a peaceful scene that we hope time would stand still. After lunch break we could not wait to swim in the UNESCO sea. The seaside near the car park at Via Olivo is quite calm. People can swim in a dedicated area. So did we. The water is warmer than we expected and there were only a few kids swimming in the sea. Part of the beach is covered with rocks. You have to be careful when you enter the water because the stony ground is very slippery. It is recommended to wear water shoes which are commonly used for swimming, paddle boarding, snorkeling and beach activities. In the afternoon the beach clubs were not well occupied. According to the information in front of the beach clubs all facilities were booked out. Many Italians have gone home for the break. One of the day trip from Portovenere is to visit the three islands: Tino, Tinetto and Isola Palmaria. Tino is a military island and Tinetto is just a tiny rock with some ancient ruins. Isola Palmaria is the biggest island of the three. It’s dotted with caves, beaches, and walking paths. You can take a scenic boat tour or a taxi boat to the islands during the summer time. Together with Portovenere they are the sites listed in UNESCO. In general if you are planning a vacation in Cinque Terre, but would like to escape from hordes of tourists and rather enjoy a more tranquil break, Portovenere is the perfect base for your journey. As there are more things to do and see in Portovenere, it would be ideal to stay there a day or two. One hotel with the best location is Torre Porto Venere. Right next to those colourful buildings at harbour front there is a historical tower which is a hotel now. That is the hotel Torre Porto Venere. It is a tower hotel which is in front of the harbour. 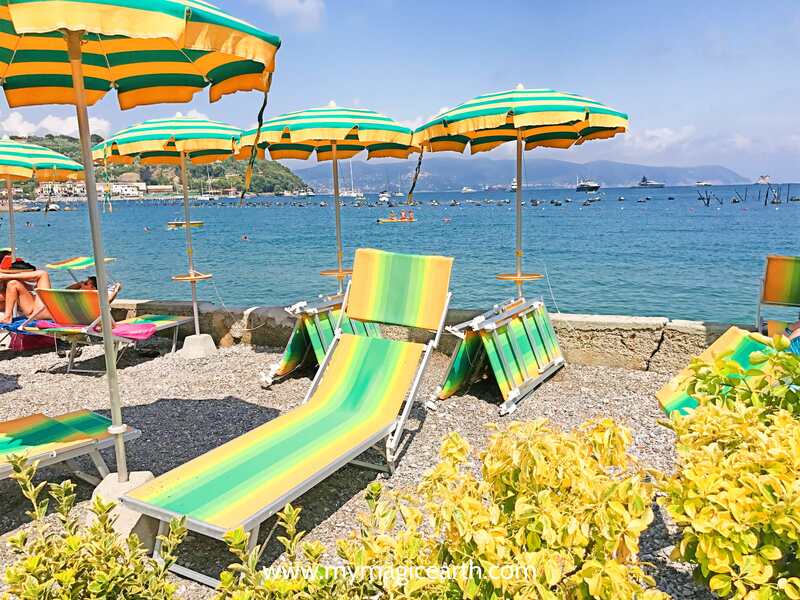 This property has one of the best-rated locations in Portovenere. The major sites are all within a few minutes of walking distance. You can take bus 11/P from La Spezia train station to Portovenere. This is the cheapest way to go there. You can also take a boat ride to Porto Venere from La Spezia, Levanto and Cinque Terre. The company Best Of Cinque Terre operates motor-ships to Portovenere as well as to other cities of Liguria. You can find a detailed motor-ship schedule and the boat routes on the company’s website. A boat tour is quite time-consuming, if you have less time you probably should take other alternatives. The quickest and easiest way is to drive there. However, it is important to know that the road to Portovenere is quite narrow and winding, so people with little experience of driving may feel insecure. You can rent a car from AutoEurope.com, it has many offers from different merchants and it is easy for you to compare the prices online. Oh my goodness! Portovenere looks absolutely perfect! Definitely going on the bucket list. Thanks for the great tips! Thanks. Just another hint if you travel to that area, you could just pick two villages from Cinque Terre plus Portovenere. The 5 villages have more or less certain similarities. It is better to stay in the area for a day or two so that you won’t get stressed out. Happy traveling!